Clap your hands – say yeah….. I have a sweater that I wish to embroider, and this is not it! 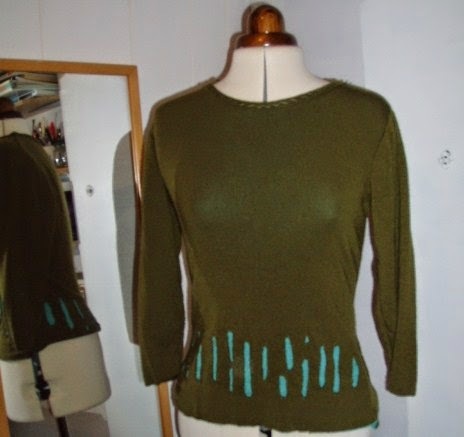 This DMC motif came up on my facebook feed and I liked it for a sweater, but didn’t want to put it on the other project so thought if I saw a cotton knit in the ‘charity’, I would give it a try as I do little hand embroidery and had never done it on a knit……. 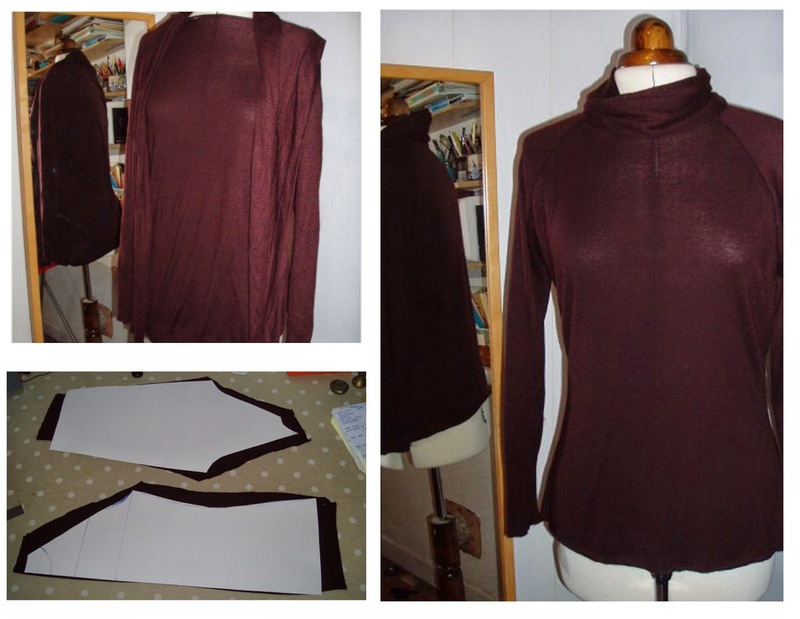 I used the Seamwork Astoria pattern (again) and modified it by lengthening sleeves and body. This time instead of the crochet edging I hit on the idea of taking the ribbed cuffs and using them as the neckline – and yipee – it worked! I also whipped it up in no time as I used the sewing room overlocker (I recently started volunteering in a community sewing room – its still in a development phase as only open a few hours here and there but will be interesting to see how it works out). I still don’t believe I need an overlocker but am definitely finding them super handy for knits. Figuring on transferring the design was a bit of a conundrum, and putting it in a hoop was a disaster. I enlarged and traced the design on tissue and wanted to see if I could sew through it (of course I could but it kept ripping). So in the end, I backed the jersey with knit vilene, and used the temporary fabric glue to apply the tissue design and it worked a treat. (I got this fabric glue to help me machine embroider velvet so its great to find another use for it). I put a board in the middle so I didn’t pick up fabric from the far side of the sweater. I did a basic chain stitch, and did Yeah in a paler shade. I deliberately did not buy new thread as I wanted to use up what I had, but I think I should have done Yeah in more of a contrasting colour. Some of the red floss, was a 8 strand that I was given with random left over craft bits, and although I got to use it up (I did 2 strands) it was very knotty so glad to see the end of it! I forgot how pleasant hand stitching is. I am hoping the next sweater works well, its a wool knit, and so far the stitches seem to be drowning in it! I hadn’t intended on making another sweater, but the longer the winter goes on, the more sweaters I need, and also this sweater pattern I adapted is perfect for me. It sews up quickly, and layers well. I got this sweater a few weeks ago, and only for the label ‘100% fine merino’ I would have left it there! As it already had a good ribbed polo, I decided to work with what I had rather than take it apart fully. I cut off the sleeves and cut the sleeves keeping the original seam in the sleeve rather than lose 1cm by resewing. I cut up the side seams. Before I cut, I double checked where the centre shoulder was by trying it on over my head, and this corresponded with how it folded when lain flat. I cut around, and sewed the side seams to underarm and inset the sleeve, and I added a pleat to the ‘cuff’. All of the cut and the sew to this point took less than 30 minutes! I tacked sleeve hems and sweater hems and pressed them, and finished by using the twin needle. Love how it turned out. Have yet to wear it layered with the floral blouse but know they will make a good match! I have a few other makes half done, and in between I moved the site to wordpress (so the half makes are still half-made). Really glad I did as I never got a proper working template with blogger. My bloglovin profile was updated too, but I was unable to transfer the subscribers from feed-burner. I don’t know how well the subscriber form works on WordPress yet, as one email worked on it but another didn’t….so if anyone cannot subscribe and would prefer email, just let me know!